1/45th scale. Reintroduced with a lot of scale detail! The scale kit introductions get another BIG boost with the reintroduction of the Little Joe II. This kit is a 1/45th scale and a skill level 4 builder at it’s finest! 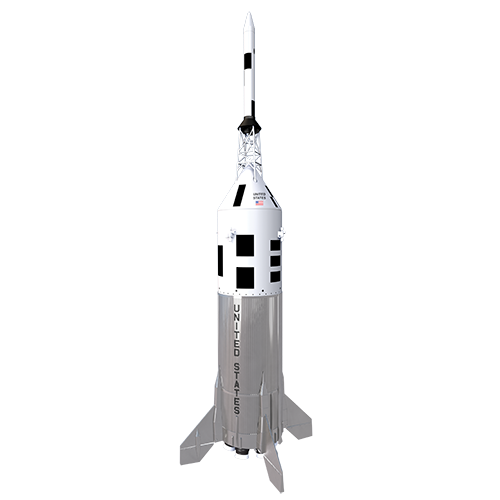 Our high quality parts along with your precision building and finishing skills will make the Little Joe II a rocket to be very proud of! We’ve also included a historical brochure for your reading enjoyment! But until you can buy the kit and for a quick history lesson, the Little Joe II was used to test the Apollo Capsule used on the Saturn V that took man to the moon. Good to see this kit return! This is a great scale kit, and a model rocketry classic. If building for flight consider leaving the RCS quads off because they are fragile. Also make sure to pick up the extra parts set, you will need the extra RCS parts and probably the tower at some point. Make sure to use the proper glue, lots of small scale parts that can pop off on landing. Built this as a kid 30 years ago…they cost like between 8 and 10 bucks back then. I just had to have this kit. The quality and looks of this kit are amazing. This kit is a lot of fun to build and not too difficult if you have built a few other rockets. You will need to review and consider some things before you start your build. There are many forums online where people explain how they built and finished this kit, what to do, and what not to, etc. I would recommend you do some googling and review them before starting. You will also want to think about what “Boiler Plate” model you wish to build. There are differences in how each is finished. I finished mine as the notorious BP 22. I flew mine for the first time on 7/16/16 on an Aerotech E30-4. Winds were very light. The rocket very quickly left the pad and flew to about 700 ft vertically (best guess), with no spin. Ejection occurred < 1 second before apogee, but this did not cause any issues. The big chute opened quickly and the rocket was recovered about 100 feet from the pad. The rocket sustained no damage and will still look great on display. Overall, I am very pleased with this kit. Take your time, think things through, and you will have a very impressive model for both display and flight! This new LJ II it spot on…excellent kit, Both wraps are beautiful and very detailed. The bottom wrap is far more detailed than the Centuri, (which I have a few of). but will require painting, which is no big deal to me. The “outboard” nozzles actually stay on for flight, rendering even more detail on the pad and in flight. The fins and fairings are plastic and very detailed. There are plastic details for the various “conduits” on the kit. I have been flying since 1967 and while I have quite a collection of “oldies”. I had to buy this kit to add to the collection. It will become a “Classic” …for that matter I think it already is. I highly recommend this kit and will be excited to fly this bird.. The Little Joe II is one of my favorite rockets . At 1/45 scale this is going to be an impressive model. I can not wait to add this to my fleet.